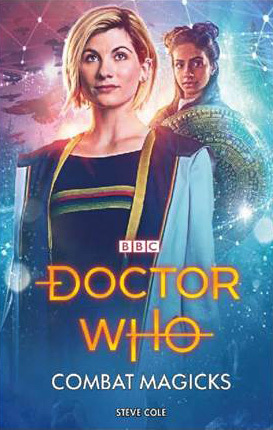 An original novel featuring the Thirteenth Doctor as played by Jodie Whittaker, with her new friends, Yasmin, Ryan and Graham. How do you win a battle when the dead fight on? Steve Cole is a best-selling original comedy, fantasy and adventure writer, Steve’s work includes a broad range of books, most recently the Secret Agent Mummy series for younger readers, Stop Those Monsters! Much in demand for his energetic performances at events, Steve has featured at sci-fi and Doctor Who conventions from London to Los Angeles. The TARDIS arrives in Gaul in 451AD, on the eve of battle between the forces of Attila the Hun and those of the crumbling Roman Empire. But the Doctor soon finds that both sides are being helped by sinister, supernatural creatures. While Graham makes allies in the Roman camp and Ryan is pursued by the enigmatic Legion of Smoke, the Doctor and Yasmin are pressed into service as Attila’s personal sorcerers. But the Doctor knows there is science behind the combat magicks – and that the true war will pit all humanity against a ruthless alien threat. Featuring the Thirteenth Doctor, Yasmin, Ryan and Graham, as played by Jodie Whittaker, Mandip Gill, Tosin Cole and Bradley Walsh. I love the covers, this one looks great. What is Novel 1 then? I’m assuming it would be The Secret in Vault 13. Correction: Apparently it’s a mistake of sorts. The Secret in Vault 13 is seperate to these two novels. So assumably Novel 1 will be announced soonish (as in, they’ll realise their mistake and fix it).